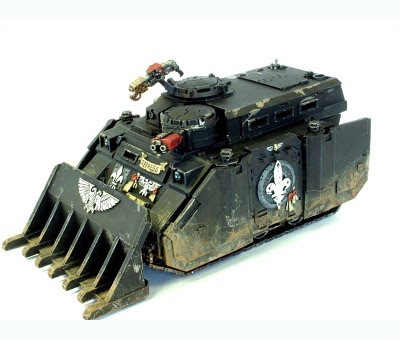 As many of you have undoubtable seen, Ron over at From the Warp has decided to put the place in statis (link) due to it turning from a website into a fully fledged job that was keeping away from the actual hobby, and much more important, his family. Personally I've been involved with another website/forum for quite a long time in various functions and things can get pretty darn hectic once the administrative / technic stuff fully comes into play. I can't even imagine how Ron managed to keep FTW going at such a high level for such a long time, regardless he has my respect and admiration for this enormous achievement. Together with Paul over at Astronomican he's been the most influential person in my online wargaming experience since the GW forums died those many years ago. On the one hand I'll be missing the tons and tons of cool stuff on FTW, at the same time though I'd rather see it stay online with its many tutorials and continued bloglists if that means Ron is able to get a breather and spend more time on the hobby activities and his loved ones. While many of us have been coming to FTW on a daily business for years on end, it is all a hobby concerning toy soldiers in the end. So simply put, thank you Ron for all the inspiration and memories and I'll be keeping an eye on your new, all hobby-themed blog (link)! Well my own hobby antics seem rather small after that news, still there is a wee bit of progres to share this weekend. First off Gideon has a new profile, this as after seeing the leaked Grey Knight codex I've just decided to go with the Imperial Guard codex to get some kind of reasonable and also themed rules set to fit with the models / conversions. This has also gotten me thinking quite a bit on the 'count as'-topic and I think I may end up dedicating a post or two to it later this week. The new list has some advantage and disadvantages, though in general I think I've managed to keep the theme going strong all over. Which naturally means any competent player with a tactically chosen force will be able to kick my behind off any tabletop, but heck this one's all about the fun anyway! Sure he may be 40K's version of a dustbuster, but I'm rather fond of the little guy. Really looking forward to painting this one, which will hopefully happen this coming week. And that's it pretty much for this weekend, thanks for reading and have a great week everybody! FTW is staying where it's at so people can access the material that's there. I'm glad the site has been a positive influence on your blogging/hobby and thanks for following my new site too. Well I can definitely say the pleasure has been all mine. Hope you had as much fun writing and working on it (hard-worked as it may have been) as all of us had checking it on a daily basis!